These days, helping your student strengthen his or her test-taking skills takes on new meaning if you live in a state that has adopted the Common Core State Standards —and the standards’ newly aligned assessment tests. Two consortiums are currently rolling out the next generation of assessments to measure students’ progress toward college and career readiness (the Partnership for Assessment of Readiness for College and Career (PARCC) and the Smarter Balanced Assessment Consortium (SBAC)). That means that the standardized tests that your child has taken in the past will look very different. In addition, school curriculums and expectations of students are significantly different than under the previous state standards. • Read all questions carefully and follow the directions. On any test, it is critical that you identify each question being asked before rushing into solving or answering the problem. • Narrow down choices. If you are unsure of the answer to a question, eliminate choices that do not make sense or are obviously incorrect (for example, answers that include words such as always and never are red flags). • When working on math problems, eliminate extra information provided that has nothing to do with the question being asked. • If you get stuck on problems, mark them and move on. You can return to them later if you have time at the end of the test, but don’t waste valuable test time spinning your wheels. • Pace yourself. At the outset of a test, do a quick calculation of how many minutes you have for each question—and give a little extra time for essay questions. Try to leave a few minutes at the end of every test to revisit skipped or troublesome problems. • Draw out problems to help yourself visualize them better. • Minimize test anxiety by keeping things in perspective. Remind yourself that tests are simply how teachers can evaluate what you know. The best form of test preparation is to keep up with homework and in-class work. • Talk with your child’s teacher about how you can ease your child’s transition to school work and tests under the Common Core State Standards. • Continue to emphasize the importance of thinking critically—an area of elevated importance under Common Core. Ask questions about what your child reads and learns. Encourage your child to talk about how he or she feels about stories, current events and more. Have your child explain his or her thinking —in both math and reading. • Embrace technology in your household. The new standards focus heavily on the skills needed by today’s 21st-century digital learners and incorporate research and media skills into all content areas. As always, one of the best ways to help your child do his or her best on any exam is to equip them with good study skills and habits. It is also important that you stay apprised of the curriculum changes that are happening in your child’s classroom and understand how those may impact the tests that your child takes. Stay in touch with your child’s teacher on the best ways for you to support your student in the era of Common Core. Huntington stands ready to help students meet the challenges of the new, more rigorous educational standards and newly aligned assessment tests. As schools’ curriculum and assessment testing evolve, students will need help that extends beyond the type of support they may have needed previously. Call Maggie Lage at 302-737-1150 to discuss your child’s educational needs. Founded in 1977, Huntington is a pioneer and leader in the tutoring industry. For over 37 years, Huntington has provided quality instruction to hundreds of thousands of students. Huntington prides itself on being “Your Tutoring Solution” for students in all grades and subjects. They tutor in reading, phonics, math and study skills; as well as advanced math and science subjects ranging from algebra through calculus and general science through physics. They also prepare students for state and standardized entrance exams, such as high school entrance exams, and the SAT and Act. If you have questions regarding the format of the exams, which exam to take, or how best to prepare for either exam contact Maggie Lage at (302) 737-1150 for free consultation. Parents who want additional information are encouraged to call the Huntington Learning Center in Newark at 302-737-1150. Dr. Raymond J. Huntington is co-founder of Huntington Learning Center, which has helped children achieve success in school for over 35 years. 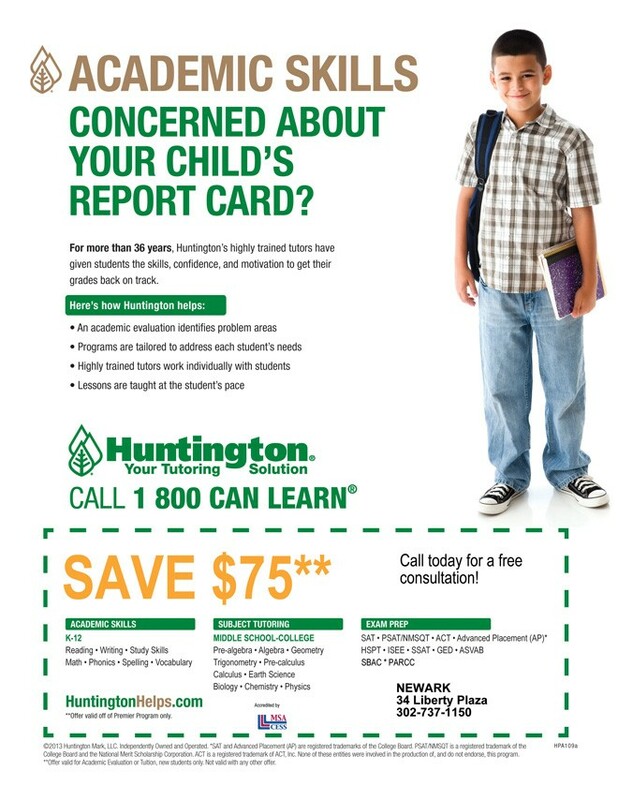 For more information about how Huntington can help your child, call 1-800-CAN-LEARN. 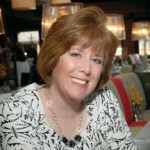 Maggie Lage is the Executive Director of the Huntington Learning Center in Newark, 34 Liberty Plaza, Kirkwood Highway, Newark, DE 19711. ← Previous Story One Student. One Teacher. One Perfect Fit!